Our family of three just recently returned home from a 7 day western Caribbean cruise on the beautiful Carnival Dream. Like we do with most of our vacations, we wanted to share details about our trip and exactly how much our cruise cost us. 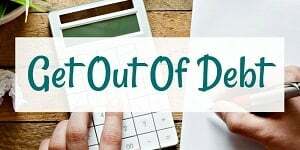 Sharing the cost of our cruise helps keep us accountable to how much we spend on vacation while sharing knowledge for others that may be considering a similar vacation. It also helps others discover costs they may not have thought about when budgeting for their next vacation. Let’s dig into the details about our trip. Afterwards, I’ll cover how much it cost and how we paid for it. This was the third time we’ve set sail on the Carnival Dream, so we knew what to expect when it came to the cruise ship itself. That’s a great thing, because our family likes to experience the cruise ship more than the destinations. In particular, we love the relaxing atmosphere of cruising. We look forward to not having to clean our house, not having to cook our meals and not having to do the dishes. We don’t have to decide where to go out to eat, either. Instead, we get on the ship, unpack our bags and simply do whatever is on the schedule for the day. We spend most of our time together walking around the ship or catching up on TV shows while we waited for our son to finish his two daily naps. This cruise we decided to book a porthole room with two small windows to save some money. Within a few weeks of booking we received an upgrade offer to move to a deluxe oceanview stateroom with a large window. Normally we wouldn’t upgrade just for a bigger window, but the deluxe oceanview stateroom has a second bathroom with a bathtub which is key with a toddler. We paid an extra $70 for the upgrade, but it was well worth it considering the other stateroom only had a shower. One of our favorite parts of cruising is the twice daily cleaning of our rooms. Carnival has cut back on this by asking if you’d prefer morning or afternoon service, but if you ask for both they’ll still do it. It took our room steward a couple days to get our schedule down, but about midway through the cruise he never missed a service. He did a great job, although a flip flop went missing halfway through the cruise and we think our toddler threw it away. 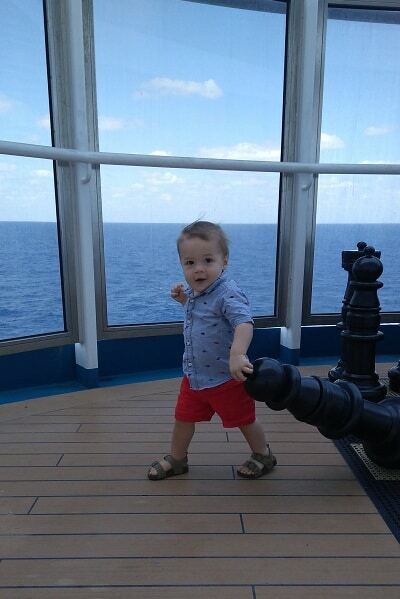 Cruising with a toddler is a bit annoying in the fact that they don’t qualify for the kids programs yet. We had to stay in the room whenever he napped or went to bed early, so we didn’t get a chance to check out most of the entertainment offered onboard. Thankfully, we had experienced much of the entertainment before. The only real bummer for us was not getting to go to the comedy club. There was time on most days to take our toddler up to the kids club to play as long as we stayed and supervised him. He loved playing with the toys and running around in an area larger than a cramped stateroom with no one else around. 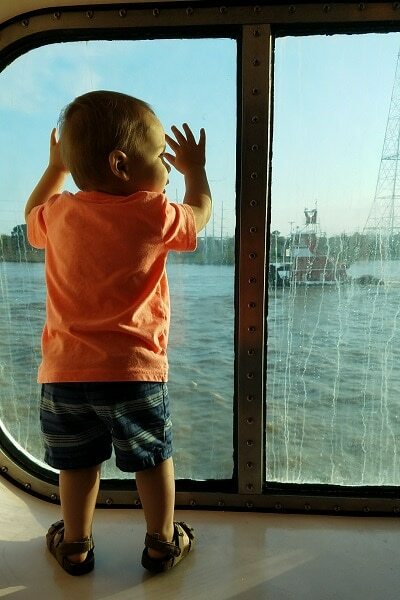 If you’re considering cruising with a baby, we shared our experience of cruising with a six month old here. Our son was very agreeable when it came to meals. He acted great at almost every meal including the sometimes hour plus brunches and dinners in the main dining room. On sea days, we’d head to the main dining room for the Seaday Brunch which we love. Steak and eggs for breakfast? Yes, please! On port days, we just headed up to the buffet for breakfast. 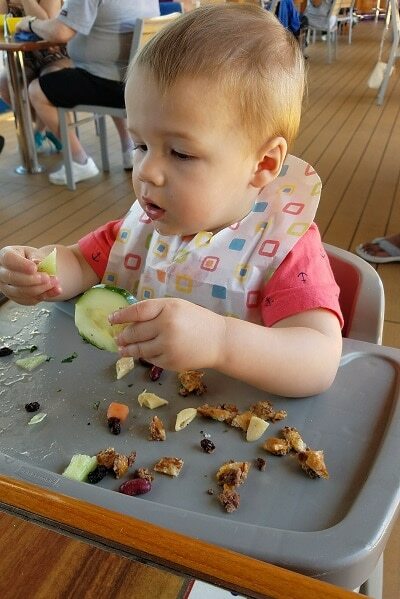 We ate our lunches exclusively at the Lido deck buffets and usually found plenty of options. For dinners, we only ate in the main dining room which is a major accomplishment with a toddler. While we did have to leave early one night because our son wasn’t feeling well, our son acted great every other night. Unfortunately, you can tell Carnival has slowly been cutting back on food quality over the years. Each cruise we notice something missing that used to be included on some of our favorite meals. We still feel we’re getting a great deal, just not as good as it used to be. This was a western Caribbean cruise with ports of call in Montego Bay, Jamaica, Georgetown, Grand Cayman and Cozumel, Mexico. While we love a good beach, we live in Panama City Beach which has some of the world’s most beautiful beaches. Rather than paying $50+ per person to go visit a Caribbean beach, we usually decide to just lounge around and enjoy an almost empty cruise ship. We normally get off the ship and walk around the area close to the port to stretch our legs and check out the souvenirs, but we don’t venture very far. 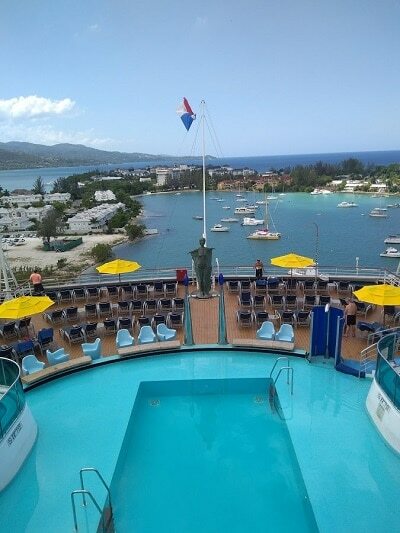 On this cruise, our first port of call was Montego Bay, Jamaica. Unfortunately, when we got off the ship there were almost no shops near the port. Instead, you had to take a $19 per person bus ride to the town center which we decided wasn’t worth it so we got back onboard. Our second stop was Georgetown, Grand Cayman. This port doesn’t have a pier, so we had to get on a smaller boat which took us to shore. We enjoyed walking around the town and our son saw his first wild chicken roaming the streets while we took advantage of some free WiFi at Cafe Del Sol. We didn’t purchase anything in town, but enjoyed the beautiful weather and tender boat rides to and from the Carnival Dream. Finally, we stopped in Cozumel, Mexico which we have been to on at least half of our prior cruises. Unfortunately, the weather didn’t cooperate and it rained almost all day. We barely got off the pier when it started raining so we quickly headed back to the ship. The rain didn’t let up until our son was taking his afternoon nap, so we didn’t do much exploring in Cozumel at all. First I’m going to cover the direct costs related to the cruise itself. This includes the cost of the cruise and anything we purchased while on the cruise. We originally booked our Carnival Dream cruise about six and a half months before the cruise sail date. This meant we only had to put down a $750 deposit for three passengers at the time of booking. Only paying the deposit ended up being a great decision because a couple months later, we ran across a promotion that saved us quite a bit of cash. More on that in the how we paid for the cruise section below. 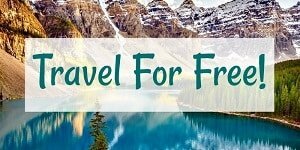 By the time we paid the cruise off in full, we ended up paying $1,724.86 for our cruise fare, taxes, fees and port expenses as well as $181.30 in prepaid gratuities. Because our son was under the age of 2, we were not required to pay gratuities for his fare which saved us about $90. When we boarded the ship, we discovered we had a refund of $32.31 in overpaid taxes, fees and port expenses. This was a nice little credit to spend while on board. Not amazing, but better than nothing. Throughout the week long cruise, we focused on spending money only where we received a great value for our money in our minds. We’re not big drinkers, so we weren’t spending $10 per drink for alcoholic beverages and we completely avoided the casino. Carnival did provide us with two free drink vouchers, but one of our drinks cost slightly more than the allowance and cost us $0.86. However, where we did end up spending some money was pictures. Our son loved posing for pictures at the various backdrops and, as you’d expect with a toddler, most of them didn’t turn out well. Two pictures did turn out really well though, so we ended up paying $43.98 for one copy of each picture. When you consider the fact that you get a professional portrait for $22, it isn’t as bad as the sticker shock you think of versus printing your own pictures. Finally, I absolutely love a very specific pastry sold at Carnival’s coffee shop and make a point to get one each cruise. My wife wanted a piece of carrot cake, so together those cost us $5.18. In total, we spent $17.71 on board after you take out the refunded taxes, fees and port expenses. This could be considered a miracle compared to some of the multi-page bills I saw people reading on the last day of the cruise. Our total direct cost of the cruise was $1,923.87. While this seems expensive to some, it was only $274.83 per day or $91.61 per person per day for everything we needed and wanted on the cruise ship itself. Of course, cruises don’t just cost the price of the fare plus what you spend on board. There are plenty of other costs that could surprise first time cruisers. In fact, I’ve listed the 11 hidden costs on Carnival cruises for those who want the full story. That said, here are the indirect costs we encountered on this particular cruise. We decided to drive to the home port, New Orleans, because it was roughly 5 hours away from home. That was just far enough to make us uncomfortable about making the trip the morning of the cruise. We decided to use points to book a Holiday Inn Express just outside of New Orleans which probably would have cost us $100, but we got it for free instead. On the way to and from the cruise port, we ate out at restaurants for lunch and dinner which cost us $62.53. It wasn’t the most frugal decision, but the convenience and meals we chose to eat made it worth the cost. When we arrived at the cruise port, we had to park our car. We decided to park right at the Port of New Orleans which cost us $140. There were cheaper garages further away which included taking a shuttle with all of your luggage. We decided this hassle simply wasn’t worth the savings because of our toddler son, his stroller and the fact that we didn’t want to lug around a car seat for the whole cruise. When we were parking, we left two bags with the porters to deliver to the ship and left a $2 tip. Finally, we had to put gas in our 2018 Honda Odyssey to drive to and from New Orleans. Our gas bill totaled $66.76. If you include the value of what the hotel would have cost, our indirect vacation related costs totaled $371.29. While we usually pay for our cruises exclusively with credit card rewards, this time we paid for most of the cruise with our savings. Even so, we still used credit cards to save quite a bit of money. As we mentioned above, we saved $100 by using hotel points we earned with our Chase IHG Mastercard. It’s a great value even with the $49 annual fee because you get a free night you can use at any IHG property each anniversary. We also managed to save $200 using AmEx Offers on two of our credit cards. Before the final payment was due, we found offers for a $100 statement credit with a $500+ purchase at the World’s Leading Cruise Lines which included Carnival. It was an easy choice to use both of these offers while paying off our remaining balance to get $200 in statement credits off the cost of our cruise. For all other costs, we used whichever card we were working toward earning a sign up bonus on. When booking and paying for the cruise, we used our Chase Sapphire Preferred credit card. However, when actually traveling on our cruise, we used our Capital One Venture card. We’ll likely use the sign up bonuses from both of those cards to fund future family adventures. If you’re interested in using credit cards to pay for your next cruise, I share how we did exactly that on a previous cruise here. 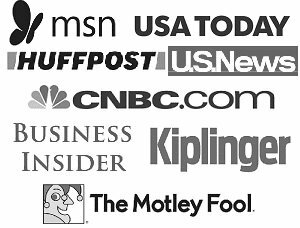 I also keep a list of the best credit card sign up bonuses available every month here for reference. In total, after account for the $300 in credits from the free hotel night and AmEx Offers, we paid $1,995.16 for our 7 day western Caribbean Carnival Dream vacation. If you ask me, that’s an amazing value for a fun and relaxing week! 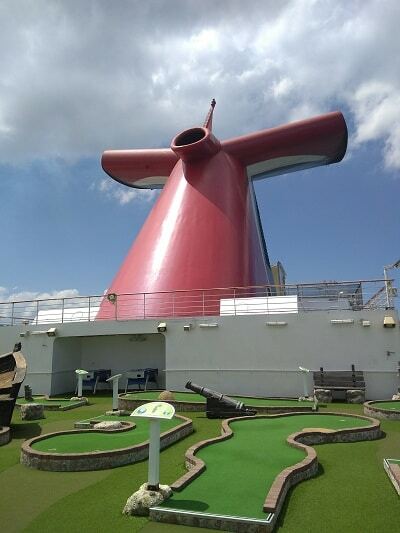 What questions do you have about our 7 day western Caribbean cruise on the Carnival Dream? I’d be happy to share!